If you like short dresses and you are aware that your slim figure looks much better in them, do not give up on the idea. Wedding dresses are usually long dresses, but it may not be the only option for you. The notion that only long dress highly elegant in today’s fashion trends to be deleted, and on the wedding ceremony in the throne slowly climbs short dress unique cuts who exudes with the elegance as well as a long dress. Be free to highlight its beauty with short wedding dress in which you will exude elegance but at the same time to achieve an urban look with a young style, who is not afraid to be original. Therefore, I present to you today a new online store that specializes in the sale of dresses for all occasions. Whichever festive event you have, simply visit Amodabridal.com.au and find your favorite dress. They have prom dresses, evening dresses, bridesmaid dresses, wedding party dresses bridesmaid dresses and of course wedding dresses. Today we’ll discuss about amodabridal short wedding dresses. They offers a huge selection of beautiful, high quality short wedding dresses in different materials and various styles to meet any budget. Thanks to them choosing the right dress for wedding day doesn’t have to be a hard task. Also they come with some pretty details like beading, crystals, zircons, sequins and embroidery. 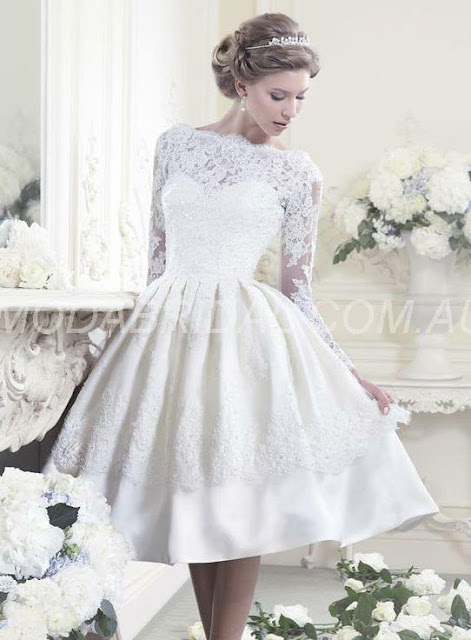 With such nearly endless options on Amodabridal.com.au there must be a perfect wedding dress for you. See how it can be suggestive and interesting short dress with lace details.